A 53-year-old businesswoman was brutally murdered in her home early yesterday morning by a lone gunman who broke into the building. 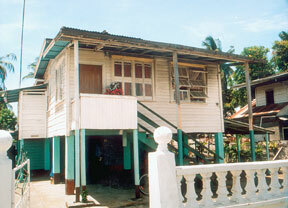 Dead is Azimoon Ally, called “Azo”, a dry shrimp vendor, of Lot 34 Back Street, Zeeburg South, West Coast Demerara. The woman’s 53-year-old cousin was taken into Police custody assisting with investigations. According to reports, about 02:00 hrs Wednesday morning the gunman gained entry to the upper flat of the building by removing two wooden bars from the back window. The intruder disconnected the telephone line before he entered Ally’s bedroom and shot her in the chest while she was asleep in bed. Reports said the mortally wounded woman scampered from her bed to the living room and began screaming but she was silenced by another bullet to the leg in the living room. It is believed that the gunman opened Ally’s front door and escaped soon after he shot and killed her. When the Chronicle visited yesterday a large pool of blood was still evident in Ally’s living room. Ally’s house where the murder took place. The woman was at the time alone in the upper flat of the three bedroom house while her elderly father was asleep on a mattress under the house and her cousin was also sleeping in the bottom flat of the building. 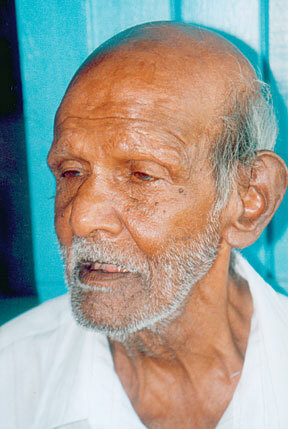 Ally’s father, Inshan Ally, 84, told the Chronicle that he was rudely awakened by two slaps from someone early that morning and he thought it was his daughter scolding him for the previous evening alcohol drinking, and he went back to sleep. “Minutes after I get the slaps on my face and covered up with the sheet without looking at the person I heard a loud sound which I suspected was a gun shot and sat up and soon after I heard another one,” the elderly man said. He was too shocked to move when he realized his daughter was screaming from upstairs and by the time he ran upstairs to investigate, he saw her lying in a pool of blood in the living room. He said he did not see anyone nor did the neighbours. Ally’s brother, Farzan Ally, 52, of Meter-meer-Zorg, also on the West Coast Demerara, said he received a telephone call about 02:30 hrs and went to the scene but was barred from entering because the Police was already there conducting investigations. He claimed that his sister had on a gold chain and rings when she was killed. He said that the woman’s money and jewels were intact and so it did not seem to be a robbery. Relatives who had gathered at the scene said Ally had sold a house in her village about two years ago to another well-known villager after an agreement was made. They reportedly paid her $500,000 as a down payment but later they changed their mind and were engrossed in an on-going court dispute over the money and property. About three years ago someone broke into her house and stole a television set. 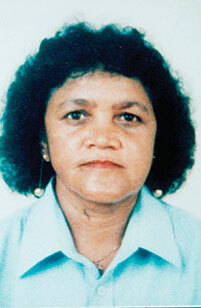 Ally was a dry shrimp vendor who supplied Guyana Stores among other businesses, and was a well established businesswoman. Ally is survived by her two children who reside in the United States, siblings and scores of relatives.